Explore the fascinating world of early civilizations and cultures with Jamestown’s Early Civilizations. The highly visual design and engaging text capture students’ interest while developing their reading skills. Each Early Civilizations book vividly describes everyday life and explores the recreation, food, laws, health, fashion, and religion of the culture. Details of each era are revealed in over 100 photographs and illustrations with call-outs that bring the past to life. Controlled readability of 5-6. Captivating material students will want to read. Focus on reading social studies. Materials in the Teacher Guide help students improve their comprehension of special studies textbooks. Focuses on the same aspects of each culture. Examine similarities and differences in civilizations and people. Encourage comparison/contrast thinking. "Did You Know?" feature. Reveals interesting and unusual facts about each era. 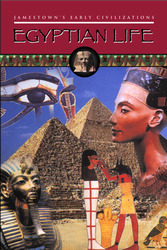 Who Were the Ancient Egyptions?